Washington, D.C. - The Senate today passed a bipartisan amendment offered by U.S. Senator Pat Toomey (R-Pa.) that would help address the serious opioid and heroin epidemic affecting Pennsylvania and states across the county. Backed by the Obama Administration, health experts, and law enforcement, this proposal would cut down on inappropriate access to opioids, improve patient care for at-risk beneficiaries, and save taxpayers money. 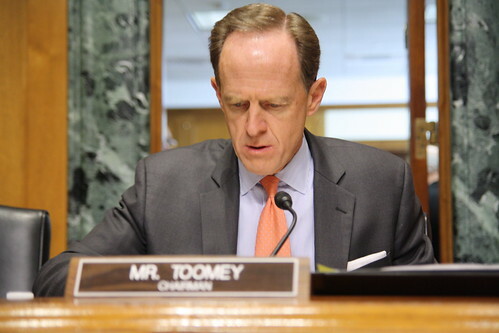 Sen. Toomey offered the bipartisan Stopping Medication Abuse and Protecting Seniors Act as an amendment to the Comprehensive Addiction and Recovery Act. The amendment, which was cosponsored by Sens. Sherrod Brown (D-Ohio) and Robert Casey (D-Pa.), passed today. Similar to policies already adopted by Medicaid and private insurers, the Toomey-Brown measure will prevent abuse of Medicare by stopping Medicare beneficiaries from going to multiple doctors and pharmacies to obtain many prescriptions and large quantities of opioids which then could be abused or diverted to the black market. "Today, the Senate showed it can work together on a bipartisan basis to address a deadly epidemic affecting so many families in Pennsylvania. By passing the Stopping Medication Abuse and Protecting Seniors Act, we will reduce the scourge of prescription drug and heroin abuse that has touched almost every corner of the commonwealth," said Sen. Toomey. "More Pennsylvanians will die this year from heroin overdoses and misuse of opioid painkillers than from the flu or homicides. It is a problem that desperately needs a solution and I am gratified that the Senate has adopted my commonsense plan that would go a long way to preventing inappropriate access to opioids." Sen. Toomey's legislation has garnered broad bipartisan support. In January, at a Senate Finance Committee hearing, Centers for Medicare & Medicaid Services (CMS) Acting Administrator Andy Slavitt backed the Toomey-Brown bill, saying it "makes every bit of sense in the world." In February, Chairman Orrin Hatch (R-Utah) spoke about Sen. Toomey's legislation, saying: "Establishing a lock-in program in Medicare is also supported by President Obama as it was proposed in the Administration's budget proposal. I applaud Senator Toomey [for his] leadership on this legislation and I hope we can move it very soon." Watch Sen. Toomey's floor speech here.